One of the greatest gifts bestowed upon me is the love of books. I can remember staying at my grandparents, and after lights out at night-time, sneaking my head under the covers and reading for hours by the light of my torch. My parents always gave us books for birthdays and Christmas. I was the middle child in a family of six, so there was a wide range of books for me to read. After qualifying as a library technician in 1990, I worked in libraries for over 20 years. I also worked in all aspects of newspaper publishing, and travelled around the east coast of Australia as an advertising consultant. In 2006, while working as manager of a bowls club in Queensland, I was faced with the challenge of finding information about other clubs for travelling bowlers. There was no relevant information available, so I drew on my grounding in library and information services, and took the gigantic step of publishing the first and only national lawn bowls directory. Ten years later, this is still thriving. Writing and research became my passion. I love meeting people from all walks of life, talking with them and researching their stories. It widens my understanding of many historical events that have happened, especially those linked to our rich military history in Australia. 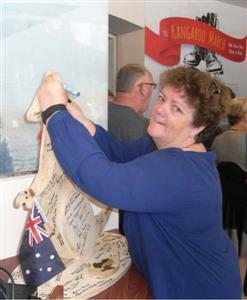 Mates4Mates and Deborah are holding readings of My Pop was a Kangaroo ANZAC around Australia during 2019. If you would like to join us and read your copy of the book to family, a school group, community group, at your local library or group meeting then register your interest today. Contact Deborah at: read@deborahcwheeler.com for more information. Help us educate our current and future generations about the Anzacs in a way that children will connect with while at the same time, helping to support a very worthwhile organisation like Mates4Mates.